Not too long ago, low-income students, students of color, English learners and students with disabilities — who had long gone underserved in our schools — were invisible, swept under rugs and behind averages. Parents had no way of knowing how well their schools were serving their children, equity advocates had no way of knowing whether students were getting the necessary learning opportunities and resources, employers had no way of ensuring graduates they hired would be equipped with the right skills for the job, and states had no real way of identifying schools that needed help to improve and setting them on a course to do so. But in 2002, sweeping federal legislation changed all that and declared an end to the days of not knowing — and not acting. It introduced one of the most powerful tools at our disposal to ensure that all students — regardless of their race, family income, home language, or disability status — get the education they need and deserve: accountability systems that measure student and school performance, identify schools in need of support, and prompt action to raise student achievement. expectations and spurring action. They set expectations for what it means to be a good school. In the 15 years since, our schools have made substantial progress, especially for low+income students, students of color, students with disabilities, and English+language learners. But despite that progress, there is still a long way to go to eliminate long+standing inequities in opportunity and student outcomes in our education system. In short: This is no time to stop. But the way accountability systems are designed matters a lot. If these systems create the wrong priorities (shifting the focus away from improving student outcomes, for example), create too many priorities (so schools have to chase 40 priorities instead of just focusing on a few important ones), or set expectations so low as to be meaningless (or so high as to be unachievable), we lose the power that these systems have to drive change. The new 2015 federal Every Student Succeeds Act (ESSA) challenges states to draw on lessons from the last 15 years and to refine their accountability systems to provide the right combination of pressure and support for school improvement. In the coming months, as state leaders hash out what those accountability systems will look like, advocates must actively participate and stand guard to ensure that these new systems focus squarely on raising achievement for ALL students. What exactly is an accountability system? An accountability system is the set of policies and practices that a state uses to measure and hold schools and districts responsible for raising student achievement for all students, and to prompt and support improvement where necessary. Accountability systems have two closely related parts: 1) a way of signaling how well schools are doing (like A-F grades, or 1-5 stars) and 2) the actions that must result from those ratings, including rewards or recognition for high-performing schools and districts, and resources, supports, and interventions for those that are struggling. Set a clear expectation that schools must raise achievement for all of their students, not just some. Celebrate schools that are meeting or exceeding expectations for all groups of students, and prompt action in those that are not. Direct additional resources and supports to struggling districts and schools to help them improve. We’ve been working on improved standards and assessments for a long time. How does accountability fit in? In recent years, states across the country — often with pressure and support from advocates — have put in place new, rigorous academic standards and assessments. The standards specify what students need to know and be able to do in order to be ready for college and a meaningful career, and aligned assessments measure whether students are on track to meet these expectations. 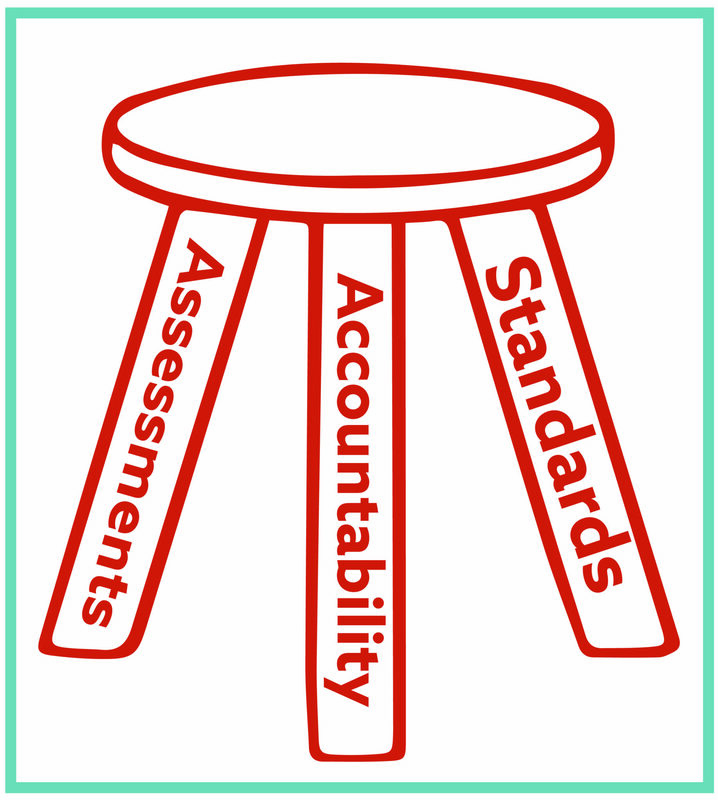 Accountability forms the third leg in this three-legged stool. While standards and assessments tell us whether students are gaining the skills and knowledge they need, accountability systems say that if they aren’t, schools and districts have to take steps to improve. This expectation of action is critical if we want all students to graduate high school ready for whatever they wish to do next — be it attend college, train for a job that will allow them to support a family, or pass the gateway exams they must take in order to serve in our country’s armed services. What does ESSA — the new federal education law — require of newly redesigned accountability systems? States have to set goals for improving student performance on state assessments and graduation rates for all students and for each student group. These goals must require bigger gains for groups of students who are further behind. States must also set goals for progress toward English proficiency for English learners. an additional indicator of school quality for all schools. School ratings have to be based on how schools are doing on each indicator for all students and for each student group. Moreover, if a school is consistently underperforming for any group of students, its rating has to reflect that. Schools that are very low-performing (in the bottom 5 percent) for one or more groups of students. Each of these types of schools must take action to improve. Districts must work with these schools to develop and implement improvement plans. If the lowest performing schools do not improve after a number of years, the state has to take action as well. Why do advocates need to pay attention? When it comes to accountability, details matter. While a well-designed accountability system shines a light on educational disparities, a badly designed one can actually hide achievement and opportunity gaps, and enable schools and districts to sweep underperformance — for all students or for individual student groups — under the rug. ESSA requirements provide some important protections for historically underserved student groups. For example, the fact that ratings have to be based on how schools are doing for all groups of students will make it harder to conceal schools’ failure to adequately support some groups of students behind higher averages. But the law also leaves many important decisions — including what exactly to measure, how to define “consistent underperformance” for a group of students, and how to support low-performing schools — up to states. States are already under lots of pressure to water down their accountability systems, and that pressure is likely to get worse in the coming months. States will be pressured to include lots of measures that make all schools look good, to give as many schools as possible high ratings (even if they’re failing to serve some of their students), and to require as few schools as possible to take steps to improve. As advocates, we must push states to measure what matters most, to maintain a laser-like focus on the progress of all groups of students, and to expect any school that is not making progress for a group of students to improve. What decisions will states need to make in the coming months? Which indicators should we use to measure school performance? 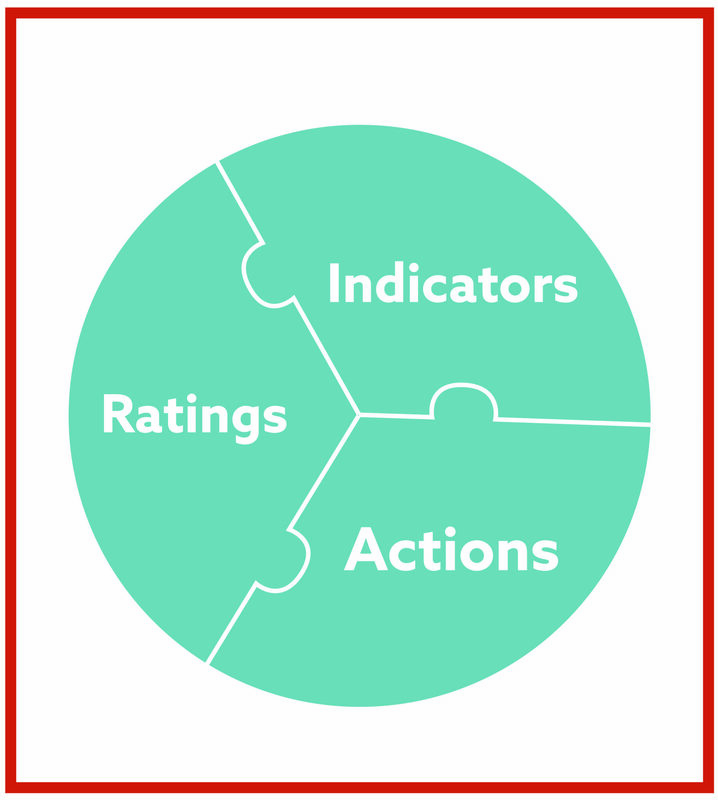 How do we combine all of the indicators we’re measuring into a school rating? How do we make sure that these ratings meaningfully reflect how schools are doing for all groups of students? What should states and districts do to ensure change in the lowest performing schools? What about schools that are doing okay on average, but are not making progress for one or more student groups? What role should parents and the community play in these decisions? Each of these pieces — indicators, ratings, and the supports and improvement actions that result from them — are critically important for creating an accountability system that expects all schools to focus on improving outcomes for all groups of students, and on accelerating learning for students who come in behind. Where can advocates get help? The resources in this packet — produced as part of the collective work of some of the nation’s most important civil rights, disability rights, education reform, and business organizations — are aimed at helping advocates and states answer the first question: Which indicators should we use to measure school performance? In the near future, we’ll be releasing additional resources to help think through how to put these indicators together into a rating system, and how states and districts can support their schools to improve. 1“Groups of students” refers to students from each major racial/ethnic group, low-income students, English learners, and students with disabilities.